Go Nelspruit met up with Charl to chat about the heart of Mopani – the dispensary. Mopani Pharmacy has been providing quality services to its customers since 1982. Mopani Pharmacy has been providing quality services to its customers since 1982, when the first of four stores opened in Nelspruit. Pharmacy Executive, Charl Weber, joined the company at the end of 2007. Go Nelspruit met up with Charl to chat about the heart of Mopani – the dispensary. “We call the robot Spencer. When I’m busy with a client and I type in a prescription, Spencer collects the medication from the shelves according to barcodes and drops it in a section near me, so I don’t have to run around. We believe that a dispensary lies at the heart of a pharmacy. Go Nelspruit: Why would you suggest Mopani Pharmacy’s Dispensary to potential clients? We believe that a dispensary lies at the heart of a pharmacy. Even though we also focus on the rest of the shop, other pharmacies might feel that the front of the store is more important. But if you have a good dispensary, you will attract clients who will also make use of the rest of your services – and not the other way around. 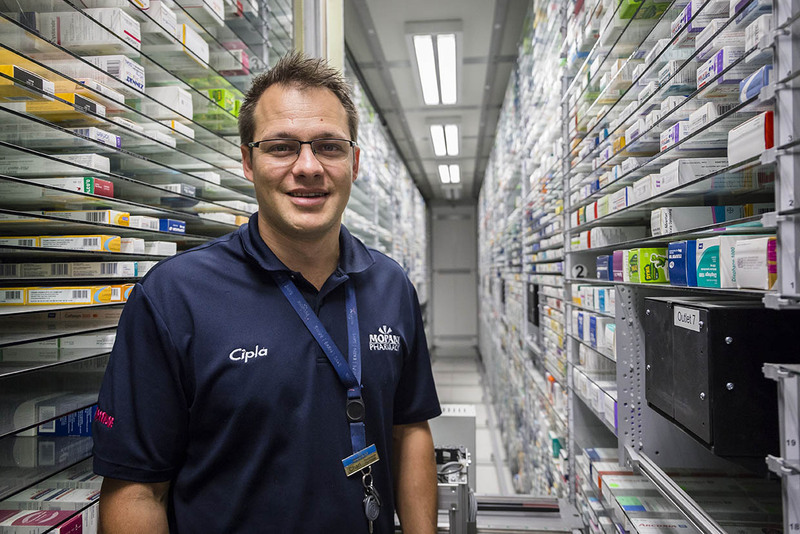 Go Nelspruit: How do you ensure that the dispensary remains the heart of Mopani Pharmacy? Our dispensaries are big, there is enough space, and there are enough people behind the counters in order to save our clients’ time. At the counters we have our frontline - as we like to call it - consisting of mostly pharmacists. I like to use the example of a doctor and a receptionist: you don’t want their roles reversed - the doctor answering the phone and the receptionist operating on clients - we feel the same here at our dispensaries. You really need to employ people who know what they are doing, especially pharmacists, and they need to be working directly with our customers. Go Nelspruit: Can you tell me more about your auto dispenser? You must save a lot of time with a robot as an assistant? We call the robot Spencer. When I’m busy with a client and I type in a prescription, Spencer collects the medication from the shelves according to barcodes and drops it in a section near me, so I don’t have to run around. It doesn’t really save time, but now I can rather spend that time with my client. Also, when doing things by hand there is always the possibility of human error. Our biggest focus is to spend more time with our clients and to eliminate mistakes. Go Nelspruit: Could you elaborate on some of the programmes driven by the dispensary, like your Chronic Medication programme and the Easyplan Blister Packing? With Blister Packs we specifically pack and divide medication into days of the week and times for clients who use a lot of mediation and who might get confused due to their age, multiple prescriptions and complex schedules. Our chronic mediation can also be prepared beforehand. If someone needs a lot of medication, especially an older client, you can eliminate waiting in queues by preparing the packages beforehand. To find out more about Mopani’s programmes, promotions and services, visit their website at www.mopani.co.za or pop into one of their four stores located at Crossing Shopping Centre, i’langa Mall, Steiltes Shopping Centre or White River Square.